You know how important it is to stay on top of all activity across your NetApp filers and be sure no unauthorized action slips under your radar. To be aware of what’s happening across your NetApp, you need 360-degree visibility in the form of ready-to-use, detailed reports that turn NetApp event log files into useful audit intelligence that helps you secure your sensitive data and mitigate the risk of a data breach. When there is a critical change to one of your NetApp filers or a user makes multiple attempts to access your critical files, you need to know right away. You can try to keep an eye on this activity using native tools for CIFS auditing. However, before you get any data, you’ll first need to determine which events you want to monitor, configure the CIFS system access control lists, specify various auditing settings and manage the resulting logs, including log file location. Once you’ve done all that, you’ll get a mountain of cryptic codes to decipher and complex details that are hard to comprehend, so it’s difficult to respond promptly to threats. Is there a simpler way? Netwrix Auditor for NetApp automatically collects NetApp log data from all available sources, regardless of location, and its AuditIntelligence™ technology consolidates that data into comprehensive, easy-to-understand reports. Instead of having to painstakingly view log files one by one, you can easily filter, sort and group the consolidated data to isolate critical information, so you can quickly take action to protect your valuable assets. Netwrix Auditor for NetApp supports all the latest versions of the clustered Data ONTAP operating system and leverages SQL Server Reporting Services (SSRS) for detailed reporting. 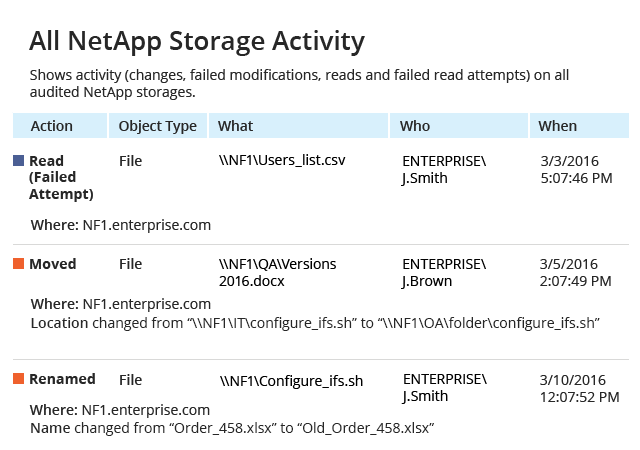 Continuously review effective permissions, see how data is used and identify data owners across your NetApp filers with file analysis reports. Identify malicious insiders and compromised accounts with Behavior Anomaly Discovery. Stay on top of everything that’s going on in your NetApp environment by simply subscribing to the reports you need. Get to the root cause of any suspicious change or access event in minutes with the Google-like interactive search. Shield your sensitive data against insider threats, ransomware and other attacks with threshold-based alerts. Keep your NetApp security intelligence in a two-tiered (file-based + SQL Server database) storage for years to facilitate in-house security investigations and periodic audit checks.